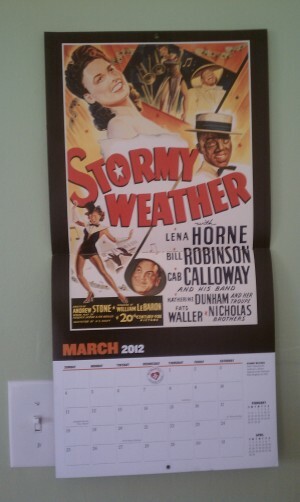 The calendar I bought for 2012 is “Movie Posters from The National Registry of The Library of Congress.” This month’s poster is for Stormy Weather. It was released in 1943 and added to the Registry in 2001. 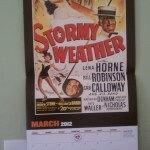 This movie was on TCM last year on a Saturday morning, and I changed the channel to it just in time. It has a dance routine by the Nicholas Brothers that has to be seen to be believed. It’s just something I think everyone should be aware of. Not just Tuesday – SPRING!!! Oh, here in ATL, it’s felt like spring since January. And I’m actually not bragging, I’m complaining. NOW, it’s fine to be spring! I love old movies. Why don’t people dance like that anymore? OMG. I’ve become my mother. Bwah! I’ve been my grandmother for a very long time. That looks a lot like how I walk to work everyday. Minus the dancing and athleticism. Also, I’m in a car driving it. Wow, that sounds amazing. You should post a video. That’s just cool. And it made me turn the old tell onto TMC. I love their giant shadows dancing on the wall from the spotlights. I didn’t really notice the shadows until you mentioned them! Those are really cool. Their shadows are the only other things that could keep up with them. That’s superhuman. Thanks for bringing it to our attention! I’ve been watching it every day for a while so I figured I should share.